Houston auto headliner repair and replacement. We offer the best quality, low cost headliners for your car, van, SUV, truck or vans and we guarantee the quality of our headliners unconditionally. 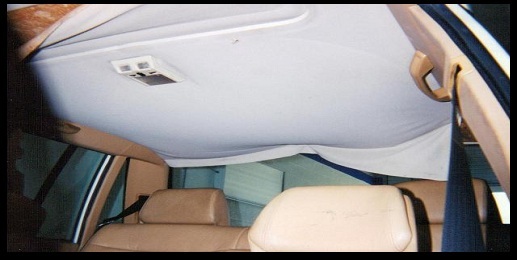 We also guarantee lowest prices on auto headliners and auto headliner repair. You will not find a lower priced auto headliner in Houston. Call us today at 281-661-8180 to reach us immediately. Why drive around with damaged headliners when you can repair or replace it cheap? Shop around, then call us and see if we do not beat the best quoted prices by other auto headliner repair and replacement shops. We give you our price quote up front so you know your cost before we begin working on your car. That is our no surprise price quote guarantee. Call us now. 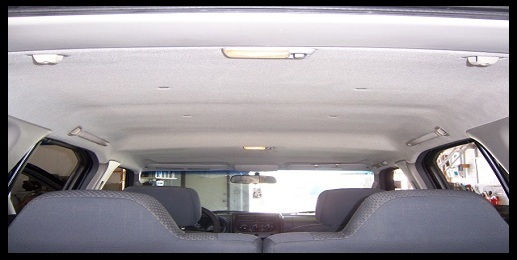 Your car’s headliner will most likely sag five to ten year from its date of manufacture. This is often caused by the deterioration of the headliner’s foam rubber backing. The sun’s harmful UV rays and extreme cabin temperatures are often to blame.